A Victoria Cross recipient killed in World War I will be excluded from commemoration activities because of a "loophole". Paving stones will be laid in the home towns of every UK Victoria Cross recipient for the centenary next year. 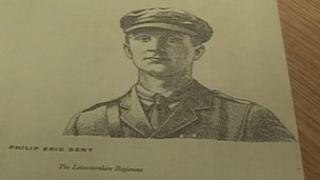 Lt Col Philip Bent lived in Leicestershire but his name will not be marked with a stone as he was born in Canada. The government said there were plans to recognise those born outside the UK. Those currently excluded include Victoria Cross recipients who had British parents but who were born overseas. Lt Col Bent lived and studied at Ashby Boys' Grammar School, in Ashby-de-la-Zouch, between 1904 and 1907. Philip Bent was born in Halifax, Canada, in 1891, but research has not determined how old he was when he moved to the UK. He lived and studied at Ashby Boys' Grammar School, in Leicestershire, between 1904 and 1907. He was a temporary Lieutenant Colonel in the 9th Battalion, the Leicestershire Regiment, known as the Tigers. At the time of his death he was the youngest officer to ever reach the rank of Lieutenant Colonel. He was shot in the head on 1 October 1917, aged 26, east of Polygon Wood, Belgium. According to his Victoria Cross citation, he was killed while leading a charge which he inspired with the call of "Come on the Tigers". Ken Hillier, vice chairman of Ashby-de-la-Zouch Museum, said he was a "true Leicestershire war hero". "It doesn't matter where he was born; what matters is that he died fighting bravely for this country," Mr Hillier said. He said Lt Col Bent's father was a Church of England vicar but it was not known if his parents were born in Britain. Mr Hillier added: "Half his short life was spent living in or fighting for the UK. He is both a Canadian and British hero. "It's ridiculous that he should be excluded from these centenary commemorations next year." British Future, a thinktank, has written to Communities Secretary Eric Pickles asking him to revise the terms of the scheme. Director Sunder Katwala said: "We should ensure that all VC winners with a substantial local connection are honoured in the most suitable place. "This loophole in the World War I centenary commemorations is clearly causing upset to communities who want to honour their local war heroes. The government should close it as soon as possible." Mr Pickles announced the paving stones scheme earlier this month. Plans on how to commemorate Victoria Cross recipients from the Commonwealth are being worked on by the Foreign and Commonwealth Office. A Department for Communities and Local Government spokesman said: "The government will be setting out more of its plan to commemorate the 100th anniversary shortly. "This will include the most appropriate way to commemorate Commonwealth Victoria Cross winners. No hero will be forgotten."